Just in time to produce a fresh spring complexion comes beta-glucan one of the next significant trends in skincare. If you’re not familiar with it, it’s a been used medically to boost immunity and promote wound healing. In skincare, it works as a collagen booster, strengthens the skin barrier, and is reported to be 20% more effective at moisturizing than hyaluronic acid. It's especially great for dry and sensitive skin but also beneficial for all skin types/those concerned with skin health and anti-aging. 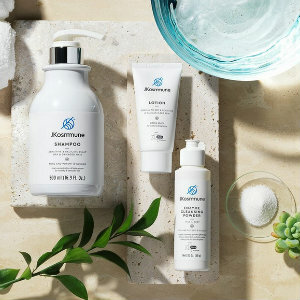 JKosmmune is a new Korean inspired beauty brand founded by a scientist that has a patented method to extract the most potent and pure (99.9%) beta-glucan on the market. Their products contain up to 50% more beta glucan than other brands and the entire line is sustainable and cruelty-free. JKosmmune’s high-grade skin care products hydrate the skin below the top layer of the epidermis, eliminating redness, irritation, wrinkles, and pigmentation. All products — including haircare line, too — contain high quality, all-natural 3rd generation beta glucan that is 99.9% pure. It protects the complexion from harmful climate effects. I’ve been trying their serum, lotion and cleanser and am happy that my skin feels less dry. JKosmmune are free of paraben, ethanol, talc, mineral oil, silicon oil, benzophenone, Phenoxyethanol, paraffin, sulfate, and color additives. The product lines include enzyme cleansing powder, serum, lotion, toner and shampoo and are available at jkosmmune.com.